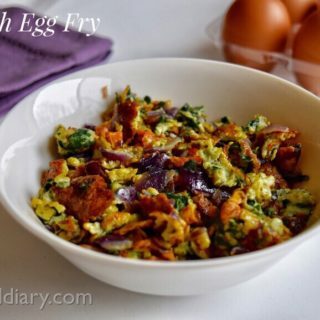 Spinach Egg Fry/Spinach egg scramble/Spinach Egg Bhurji – scrambled eggs recipe with spinach, eggs, onions and cheese. 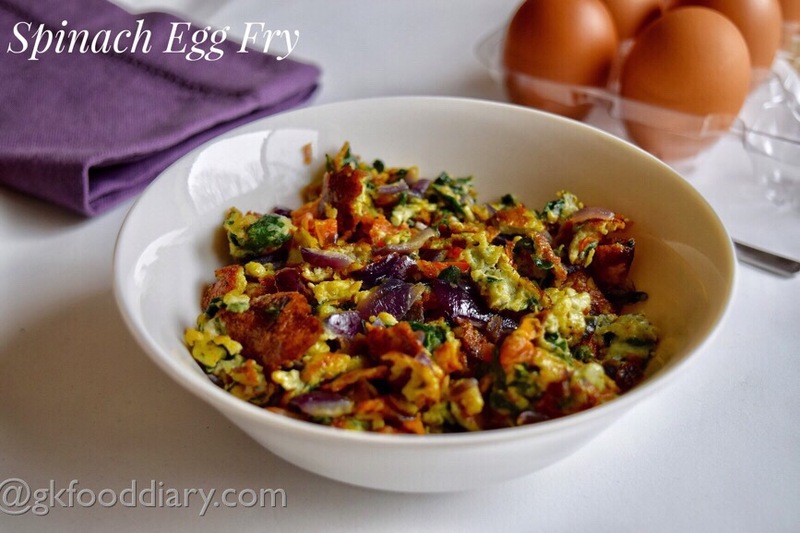 Spinach egg fry is a healthy meal or snack option loaded with protein, vitamins and iron. Its a true winner recipe with kids and everyone else as it tastes so good and flavorful. 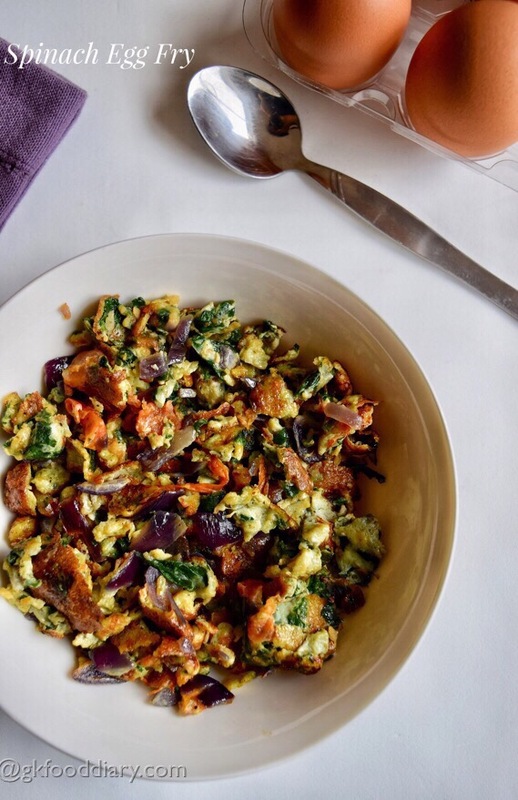 This spinach egg scramble is a good option to make the kids to eat spinach and You can give this to your babies from 10 months after introducing eggs and spinach separate. This can be a quick breakfast/dinner or as an evening snack. Check more egg recipes for babies, toddlers and kids. 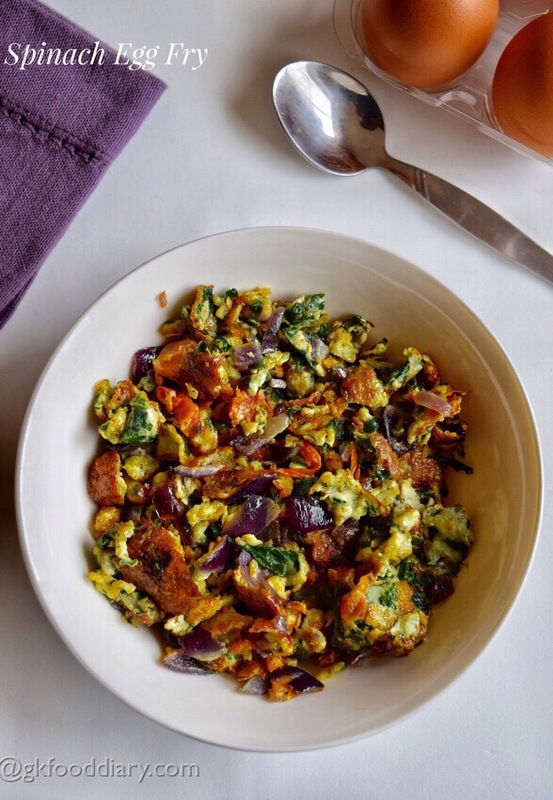 Let’s get on to check how to make this easy egg spinach scramble for babies, toddlers & kids. 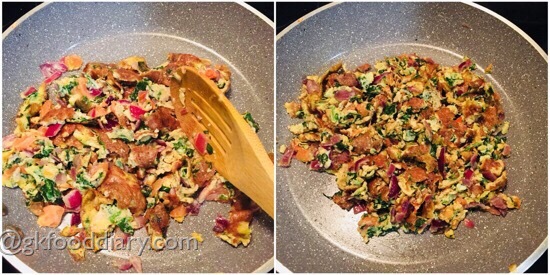 Egg Spinach Scramble - Easy egg scramble with spinach. 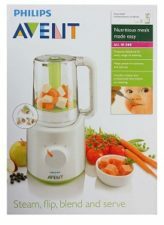 Tasty evening snack or breakfast/dinner for toddlers & kids. Keep all ingredients ready. 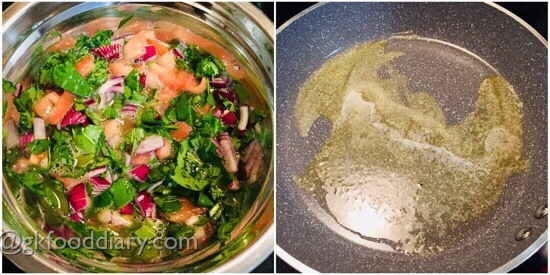 Finely chop the spinach, onions and tomatoes. Set aside. Beat the eggs well and sprinkle salt,pepper powder and turmeric powder. Mix well. 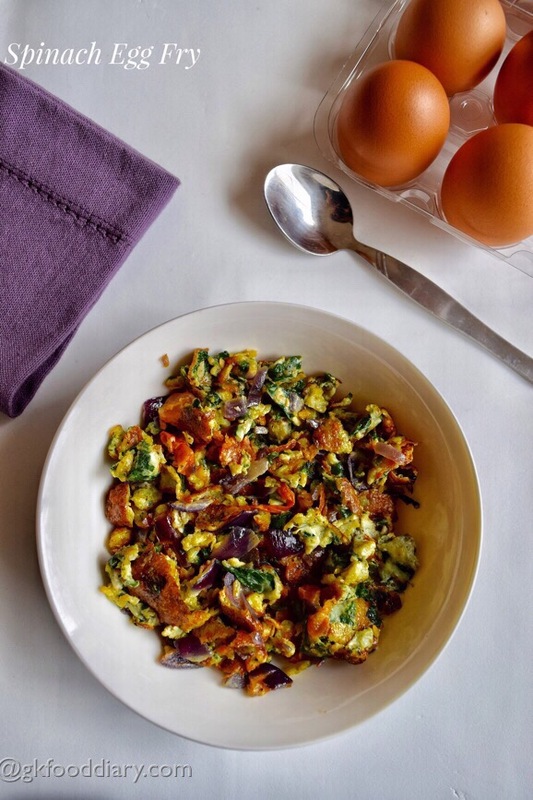 Then add chopped spinach, onions and tomatoes to the beaten egg. Mix well. Mix everything well. Heat a tsp of butter in a pan. Spread the egg spinach mix to it and sprinkle cheese over it. 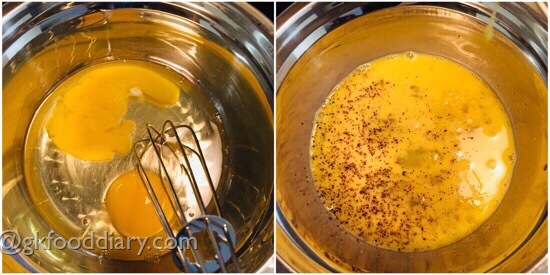 Keep on stirring the mix until eggs are well cooked. The tasty egg spinach scramble is ready! 1. Keep all ingredients ready. 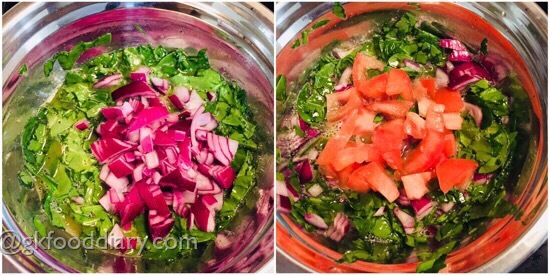 Finely chop the spinach, onions and tomatoes. Set aside. Beat the eggs well and sprinkle salt,pepper powder and turmeric powder. Mix well. 2. 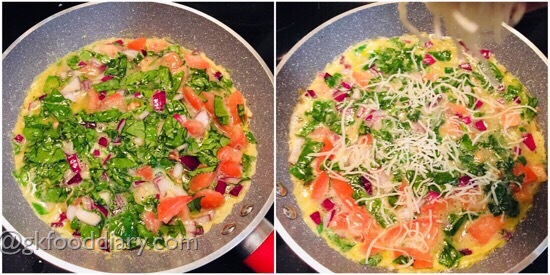 Then add chopped spinach, onions and tomatoes to the beaten egg. Mix well. 3. Mix everything well. Heat a tsp of butter in a pan. 4. Spread the egg spinach mix to it and sprinkle cheese over it. 5. Keep on stirring the mix until eggs are well cooked. The tasty egg spinach scramble is ready! Any spinach variety can be used to make this recipe. Make sure that spinach and eggs are cooked well. Adjust spices according to your preference. You can add green chilies for older kids to make it spicy. You could also use vegetables like capsicum, carrot or corn (cut into cubes or grated) along with spinach. Garnish with chopped coriander leaves if you prefer. Make sure your kid is not allergic to any of the above listed ingredient before you try.